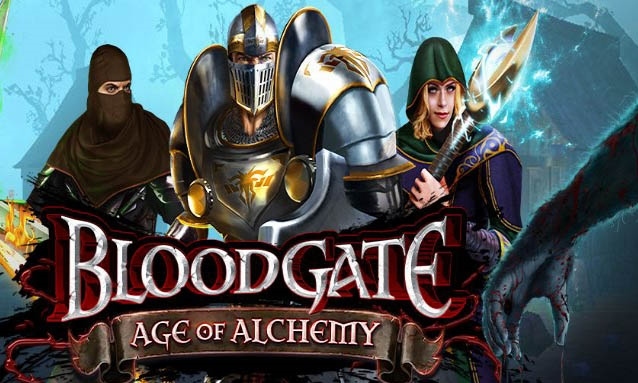 Blood Gate - Age of Alchemy - Face the darkness in Blood Gate: Age of Alchemy, an epic gothic adventure where fast-paced puzzle action, meets intense real-time combat in a one-of-a-kind mobile RPG. Destroy devastating demons and rid the empire of gore, dark magic, and madness. Will you rise to the ultimate glory? Toskyr has fallen to a plague of alchemic destruction. Behind the legendary Blood Gate, the plague’s scheming creator, Black Dahlia, awaits the day she will leave her prison and inherit a blood-drenched empire. Toskyr’s Czar has summoned you, the bravest of heroes, to save his devastated kingdom. Traverse dangerous dungeons, raid valuable loot, and slay Plague fiends by customizing and upgrading your heroes with powerful spells or gear. Rid the empire of Black Dahlia once and for all! Experience gaming’s first ever combination of real-time combat, fast-paced puzzle action, and high-speed onslaught. React swiftly and time defenses carefully to counter foes! Slay evil beasts and powerful demons while unlocking dangerous ruins, holy temples, mythical jungles, and much more on your quest to gather powerful loot. Raid and collect over 900+ exotic spells, weapons, and armor sets. Tactically upgrade and equip your deadly heroes to devastating effect. Scale the real-time leaderboard and crush your enemies in new league divisions. You must destroy friends & foes in intense PvP battles to earn powerful rewards! Connect with other players and unleash the ultimate tag team strategy to vanquish enemies in epic boss battles! Outsmart is located in Auckland, New Zealand. Outsmart creates immersive entertainment experiences for audiences on both PC and mobile. DeNA (pronounced “D-N-A”) is a global Internet company that develops and operates a broad range of mobile and online services including games, e-commerce and other diversified offerings. Founded in 1999, DeNA is headquartered in Tokyo with offices and game development studios across the globe. DeNA Co., Ltd. is listed on the Tokyo Stock Exchange (2432). For more information, visit: dena.com.